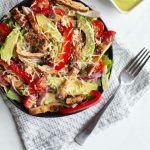 This fajita chicken salad is a mix of grilled fajita chicken, peppers, onions, tomatoes and more laid atop a bed of romaine lettuce and topped with a bright and refreshing avocado lime dressing. 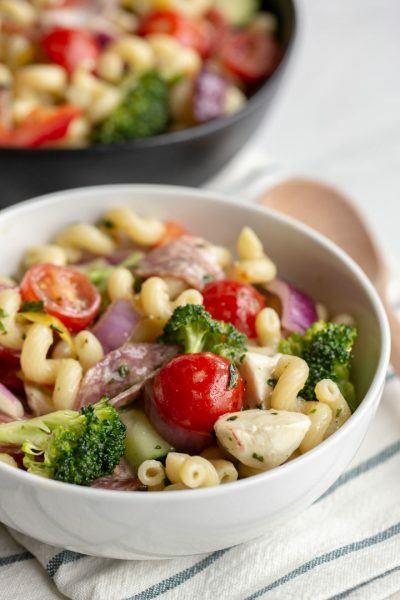 Well, I’m no stranger to salad recipes, but the only ones I’ve posted so far are of the pasta and chicken salad varieties. 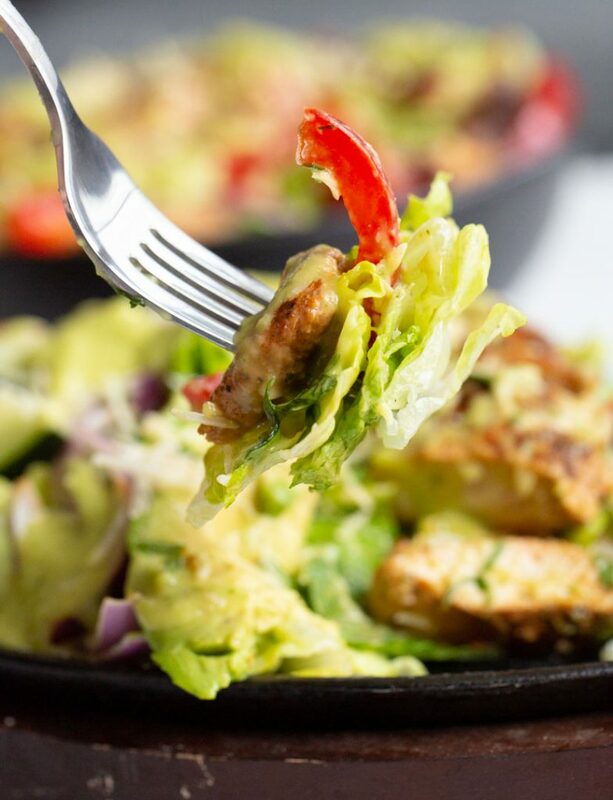 So it was only fitting my first real salad post is a grilled fajita chicken salad. I was born in Texas, after all. The veggies in this recipe can be grilled or served raw. I like putting raw peppers and onions in my salads, as it gives it that extra crunch and for me, texture is key. 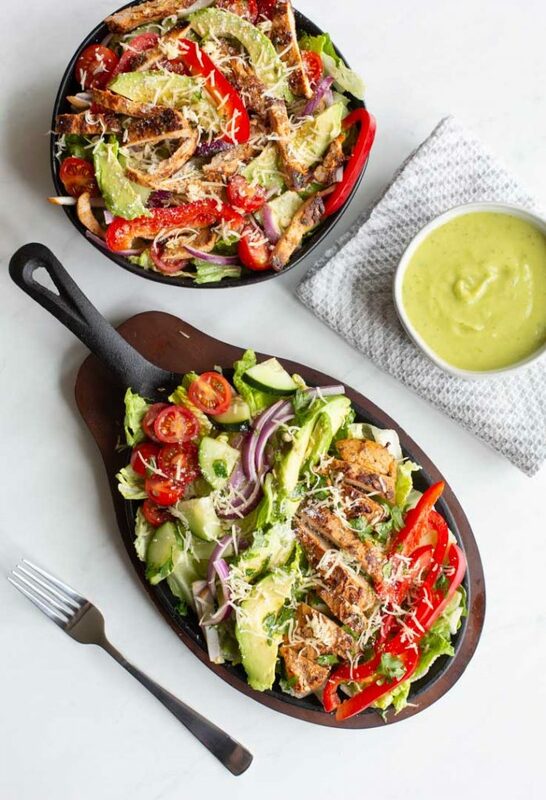 I’ll admit I’ve never been one of those people that can put together those incredible, meticulous looking Instagram salads and acai bowls where everything is lined up just so. 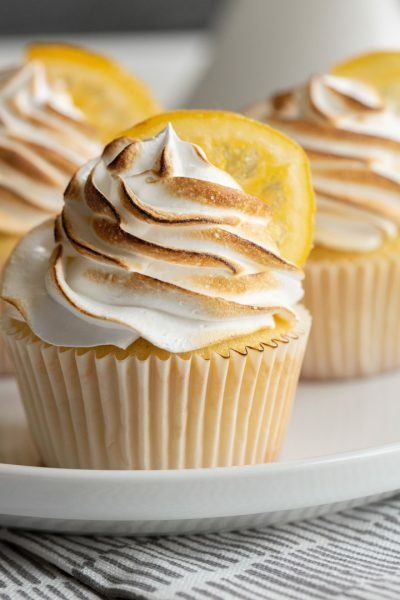 I don’t tweezer my food. Most cooks don’t tweezer their food at home, and y’all… it’s a salad. So in the pictures I tried my hand at lining everything up just so on the skillet. And in the other bowl, I just kinda plopped everything in. 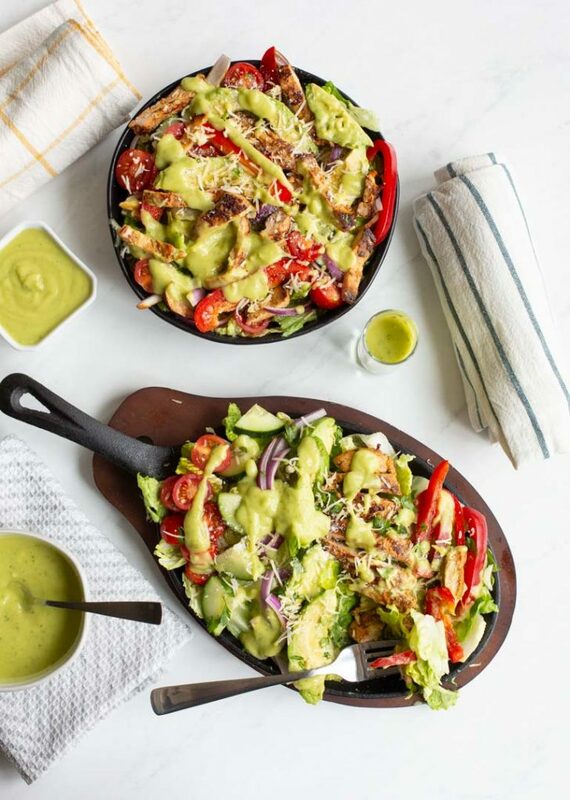 I think one of the greatest things about salads is you can just plop your toppings on and it will still look beautiful! 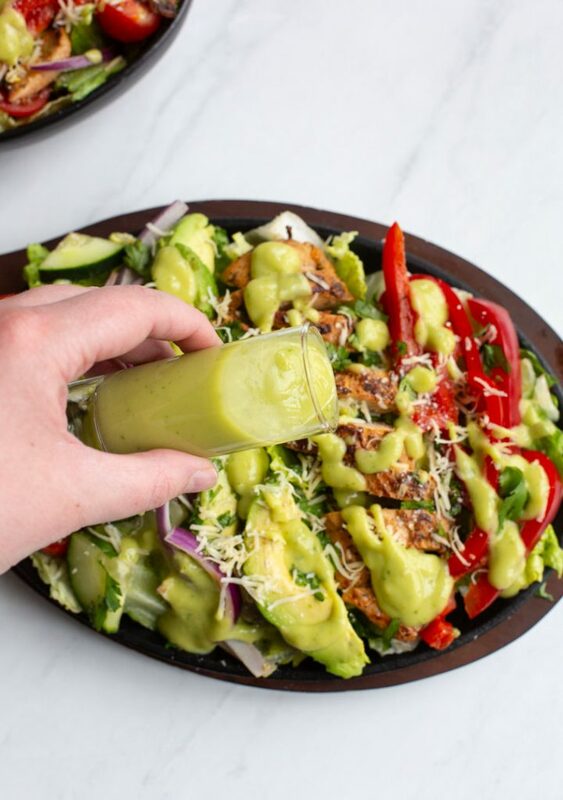 The different colors and shapes provide all the beauty, not to mention that gorgeous green avocado lime dressing! As for the chicken, you can use the premartinated chicken you can buy at the store (Trader Joe’s Carne Asada is awesome), or you can use a recipe. I’ve been using this one for years. 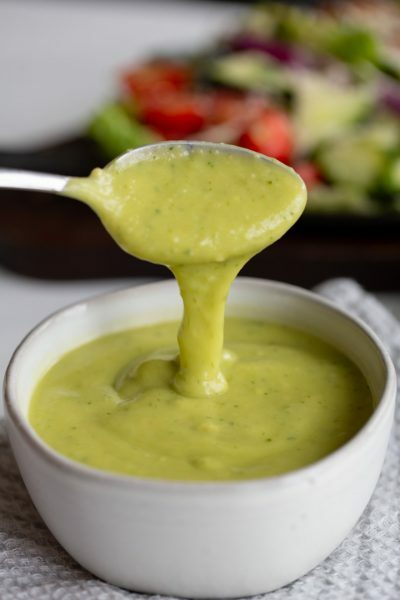 And don’t forget the dressing! 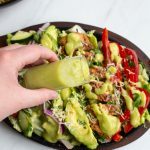 It’s super easy to just throw everything in a blender, so you can either make it ahead of time or when preparing this salad. 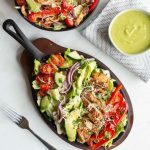 This is a great summertime salad and the perfect way to use up any leftovers from a backyard fiesta. I could have fajitas every day, every week, but at some point the tortillas always run out. 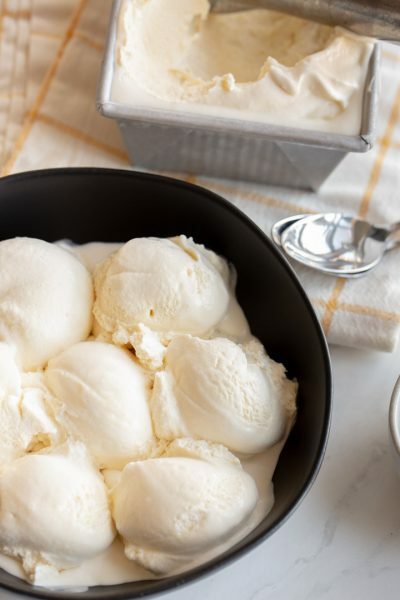 And it’s just a tasty, refreshing, bright salad that makes me feel like I don’t need to wait another 30 minutes before hopping back in the pool. 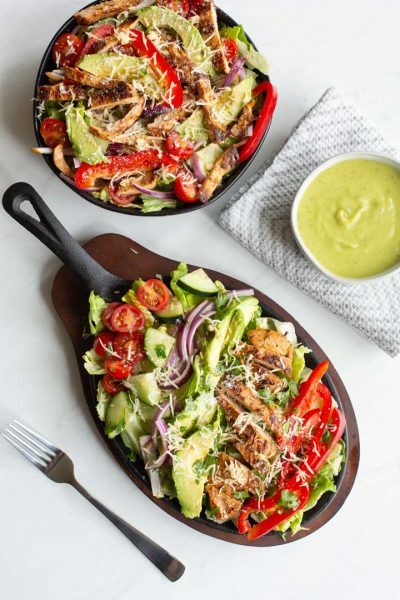 In a large bowl, place the lettuce and top with the peppers, onions, sliced avocado, cucumber and tomatoes. 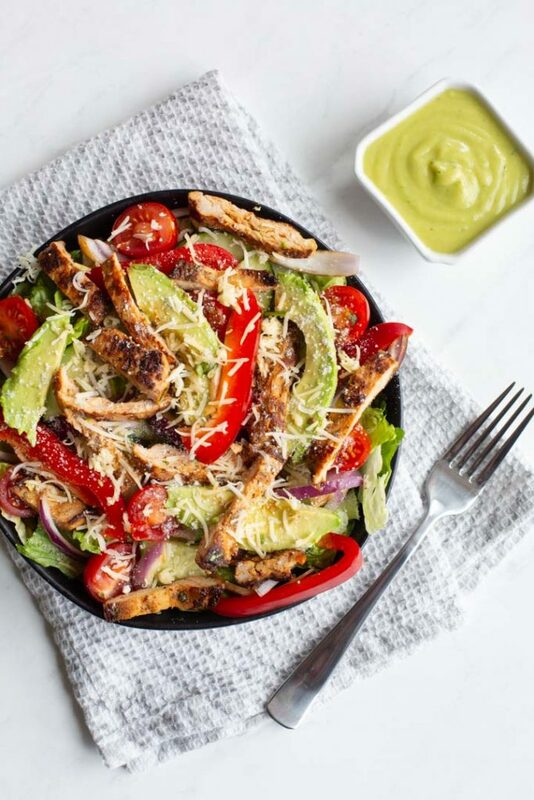 Slice the grilled chicken into strips and put on the salad, then top everything with the cheeses (optional) and the avocado lime dressing.